An antique house of the Renaissance, surrounded by a quiet park of olive trees making part of the property. Fully renovated with high quality materials, the villa has been furnished with good taste in a mix of antique and design, always light and fresh. Total privacy in a haven of peace for the whole family. Large fenced garden and swimming pool nestled among the flowers. The large terrace overlooking the front of the house is a perfect place where to admire the scenery during the aperitif, lunch, and dinner. Owner of Diaframma Srl, a company for Tv advertising production. Perfectly placed into the quiet hill, a few nìminutes drive to supermarkets, shops, and with easy access to the communication. A perfect retreat for every family. 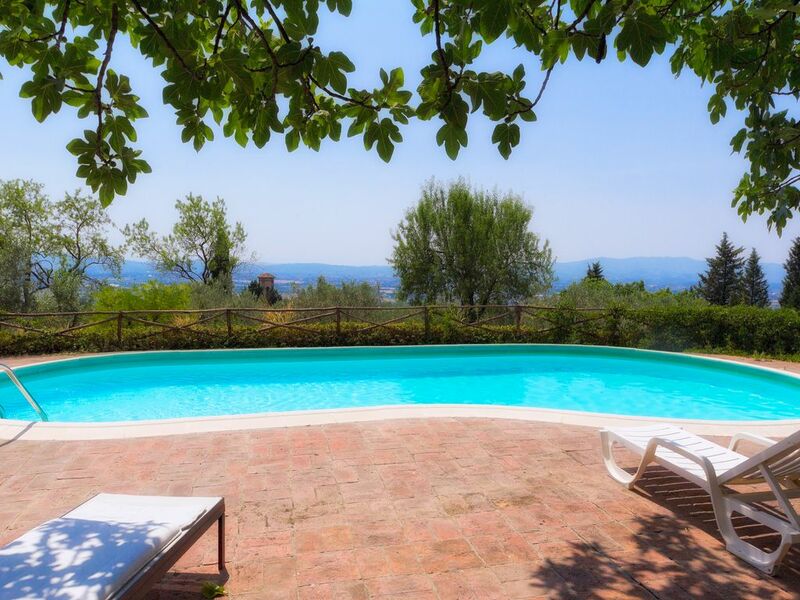 Villa in a perfect location with great views over the Florence valley. This Renaissance countryside house has been perfectly restored by the owners with great taste for the decoration and high quality materials. You will feel the warm atmosphere of a real Tuscan house. The pool has a splendid view over the countryside and the 10.000 sq. meters park. A gardener keep the garden and pool in order every day. Three bathrooms have shower, sink, wc, bidet. One bathroom have only sink and wc. Heating available during winter time. The price is already included. Parking inside the property, with electric gate, is available for about 10 cars. Towels and linens are included. Living room with piano, Sat TV, Fireplace. Kitchen with plenty of light from two windows. Oval table with chairs is available in the dining room next to the kitchen. All vessels are located in the same room. 1 hectare / 2.5 acres of private garden with olive trees and fruit trees. Completely fenced with high walls or net. A few km away from the villa you may find a tennis court available for rent. Golf is available at about 25 minutes drive from the villa. Swimming pool for your exclusive use. On request we can provide a personal chef, a cooking class, cleaning services during your stay. All services requires ahead reservation much before your arrival date. A beautiful Tuscan experience - the best! thank you very much indeed for your beautiful comment. You family is very lovely and we had a great pleasure to host you at the villa. We are really happy to know you enjoyed your stay and you liked our villa. Hope to see you again in Tuscany. In cas you will come back please contact me for any suggestion about our beautiful region. Wonderful! Beautiful views. Charming villa. Extremely helpful owner & caretaker. A great place! carrie g.Where do you live? Our family of 7 had a fabulous experience. The villa was perfect for us. David helped us with directions, restaurant recommendations, etc., including connecting us with a private chef who we hired to cook for us a couple nights. Mr. Mario the caretaker was there every morning to take care of the pool and grounds, and was helpful as well. We spent our days by the pool and our evenings on the patio, sitting around the big table. It was an easy drive to the local train that took us to Florence, but driving into Florence train station was easy enough as well. The nearby town has everything you need. The carrefour only 10 min drive. The layout of the villa was lovely and comfortable. We would highly recommend a stay here!! I’ll bring up just a couple things to be aware of: in the summer bring bug spray. the villa has no AC downstairs. The weather was extremely hot when we were there, but we made due with a fan in the dining room. The road to the villa is long and hilly. So unless you are a hiking enthusiast, you’ll need a car. Sifflez en haut sur la colline!!!! Maison en haut d'une colline avec une vue imprenable sur la plaine de Florence! Calme et chants des cigales sont à l'honneur! Visites des grands sites (Pise, Sienne, Florence…) avec accès rapide à l'autoroute! Il a fait très chaud et la piscine était un délice! Attention aux guêpes avec le figuier juste au dessus (un platane aurait été une meilleure idée!) chambres grandes avec climatisation appréciée, sauf celle du bas qui est une peu triste! l'espace était amplement suffisant pour 10 personnes dont 6 enfants! Séjour agréable dans l'ensemble malgré chaleur et violent orage! Merci au propriétaire pour cette jolie location et sa disponibilité. J'espère vous voir encore dans notre maison près de Florence pour vos vacances. Yoga am Pool - Slackline zwischen den Olivenbäumen - großzügiger Wohnraum, romantisch eingerichtet - BBQ bei Regen unter einem großen Vordach mit Blick auf die Umgebung von Florenz. Wir haben uns sehr wohl gefühlt. Der Pool wurde jeden Morgen gereinigt und manchmal gab es auch ein Frühstücksei. Einzig WLAN funktionierte sehr langsam und das Zimmer hinter der Küche war weniger wohnlich! We are really glad you enjoyed your stay. You did not communicate to me during your stay that the wifi was slower than you expected. We are here to help you fix any problem, but if you do not ask, we imagine everything is going perfect. Thank you for staying in our villa. Hope to see you again. The villa was much more then we expected. spacious, well decorated and beautiful terrasse and view. Mario was always there to help us if anything. Thx again and hope to see u soon. thank you very much indeed for staying at the villa near Florence and for your nice comment. La maison est tout à fait conforme à la description. il y a une belle piscine avec une vue de rêve (vraiment ! Et le soir c'est encore plus beau ) et un champ d'oliviers dans la propriété. La maison a du caractère, elle est spacieuse et agréable. Les interactions avec le propriétaires ont été très efficaces, avec de la gentillesse pour nous arranger en fonction de nos besoins. La piscine et la terrasse sont entretenues tous les jours ce qui est fort agréable ! Enfin la région est bien sûr magnifique ! Nous vous recommandons vivement ! Nous sommes herbeux de connaitre que vous avez bien aimé votre séjour. J'espère vous voir encore dans notre maison près de Florence. 2 Km from the A1 highway exit Firenze Calenzano. In less than 5 minutes drive you reach several Supermarkets, restaurants, outlet and any sort of shops you need. This house is a perfect location to explore Florence and the whole Tuscany. Pistoia 20 minutes, Lucca 1 hour, Arezzo 1 hour, Siena 1:15 hour, the beaches 1 hour. Everything is at hand. Tassa di soggiorno: 2 euro per persona superiore a 11 anni di età, per ogni settimana di soggiorno. Tariffe scontate in relazione alla durata, Deposito cauzionale, Caparra richiesta alla prenotazione, Proprietario non presente in loco.